On the North Coast we are far enough away from two pending State water projects that we don’t hear much of them. Nevertheless, both have the potential to seriously impact our salmon fishing. As to whether the impacts will be positive or negative – that’s hard to say. These projects are the Twin Tunnels, and a proposal to raise the height of Shasta Dam. If you are about forty years old or more, you likely remember the first time Jerry Brown was governor. The apartment instead of the Gov’s mansion, his Plymouth sedan, the Peripheral Canal — maybe it all comes back to you if you think about it. For those of you who don’t remember, or are too young, in the early 80‘s the Peripheral Canal was Governor Brown’s pet project to move fresh water around the delta and send it to Southern California. Politically it sparked an intense fight between Southern California cities and water districts against Northern California fishermen, local water users and environmentalists. Ultimately in 1982 the Peripheral Canal was overwhelmingly defeated at the ballot box. A few years later, Governor Deukmejian floated a smaller project often referred to as “Duke’s Ditch”, which was also rejected. So here we are three decades later. Governor Brown is back, along with his current plan to send Northern California water to Southern California. The current proposal is to dig two parallel tunnels 150 feet below the delta, wide enough to install a 3-lane freeway, and 35 miles long. After clearing the Delta the tunnels would surface and connect to an existing north-south aqueduct. Getting at the most important facts is hard, because the pro-tunnel government and water district interests make some pretty extravagant claims, and the anti-tunnel forces get a little hysterical at times. Nevertheless, here is some of what I’ve been able to gather so far. I don’t understand the politics of this, but it appears that unlike 1982, this project can be done by the State without any kind of vote being put to the general population. In 1982 when the Canal project was defeated, California had 24 million residents. We now have 38 million, and most of the growth has been in the big cities. As always, most of our rainfall is in the north and most of our snow falls in the Sierras, but most of our people live in the Bay Area and far Southern California. Given the location of the votes, it isn’t clear whether a popular vote would approve or reject the project. The current timeline projects 2016 ground breaking and 2026 ribbon cutting ceremonies. The current cost estimate is $14 billion. Construction and operational costs are proposed to be billed primarily to those who would get the most water — specifically the Metropolitan Water District, some cities near San Francisco and Central Valley irrigation districts. Some of those entities could likely make a tidy profit by reselling water to users further south. Residential users as far south as San Diego could see their water bills rise about $6 per month as costs are passed on. Proponents of the project claim that the amount of water to be sent south won’t be any higher than what has historically been available. They claim that the location of the pumps and the design of the screens will actually protect salmon and delta smelt better than the existing pumps. However, the proposal calls for the existing pumps to remain in place and to continue in use, though on a more limited basis. Critics claim that this is just another project to rob the Delta of fresh water essential to the environment, local farming and fishing interests. They further note that this is earthquake country and there is no guarantee that one earthquake won’t destroy the whole tunnel project. Proponents counter that many of the Delta levees are aging and could also fail in an earthquake or high water event, and assert tunnels are less likely to fail than the existing aging infrastructure. Proponents claim that the tunnel project would make water deliveries more stable, and benefit vital farming interests which are currently at the mercy of uncertain delivery. Critics point out that much of that uncertainty is the result of government water agencies committing to deliver more water than they have any business selling. Particularly in dry years, courts have been forced to intervene to prevent some water deliveries in an effort to protect Delta fish populations. So, that’s the bare outline. Would the proposed tunnels benefit fish by killing fewer salmon outmigrants and smelt? Would this simply turn into another water spigot sending vital water south, and ultimately helping to destroy one of the major salmon producing rivers in the state? Will the proposed cost simply prove too high for a state already struggling with massive debt? Will legal challenges in the court system scuttle the whole thing? At this time the governor and his team are going ahead at full throttle. The second project I mentioned in the opening paragraph is a proposal to raise the height of Shasta Dam anywhere from six to 18 1/2 feet. For those of us who haven’t been there, Shasta Dam is the 8th highest dam in the country, and the largest reservoir in California. When full it holds 4.5 million acre feet of water. Shasta holds back water arriving from the Pit, Upper Sacramento and McCloud Rivers. The dam is one of the cornerstone reservoirs for the Central Valley Water Project. The Bureau of Reclamation claims that the proposal is intended to improve conditions in the Sacramento River for salmon and steelhead, increase our water supply and improve supply reliability for downstream water users. If raised by the highest amount proposed, which is clearly what the Bureau is leaning toward, the lake would hold about 13% more water when filled. One immediate question put forth by opponents is “why bother”? The lake only hits maximum pool about once every six or seven years, and then starts dropping as stored water is sent downstream. If they can’t reliably fill the existing lake, making it higher just means it would fill even more rarely. In addition, critics are quick to claim there is a link between this project and the Twin Tunnels described already. The basic argument is that a larger dam will result in less water flowing into the lower river during the wet season so that the dam can be filled higher, and that once full the extra water will be sold to SoCal water interests and shipped south via the proposed tunnels. The assertion is basically that the extra cold water would be shipped south based on farming and business schedules and needs, not on fish population dynamics. The Bureau admits there are a long string of significant impacts. While the Bureau claims this will help downstream fish, the US Fish and Wildlife Service claims the benefits would be negligible for anadromous fish. US Fish and Wildlife studies indicate no benefit to salmon 90% of the time. However, what if that last 10% of the time the extra water made a significant difference? Other studies indicate that 5% water conservation by Central valley alfalfa farmers could save seven times as much water as the extra output the proposed larger lake would produce. Another significant impact of raising the water level would be the flooding of thousands of acres of the Shasta-Trinity National Recreation Area. Additional impacts include replacing six miles of public roads, the relocation or modification of five bridges, the destruction of dozens of marinas, campgrounds, utilities and wastewater systems, and flooding areas considered sacred to the local Winnemem Wintu Tribe. The raised lake would flood 1 1/2 miles of the McCloud River, which is protected under federal law and the California Wild and Scenic Rivers Act. Curiously, as I was not able to track down the rationale, the proposed lake level rise is projected by some critics to reduce Shasta hydropower output by about 5%. Currently the project is anticipated to cost $1.1 billion, and require $54 million in annual operating costs. The Bureau feels the public would receive 60% of the benefits, and based on that estimate would bill taxpayers for 60% of the costs. The “public benefit” is based on a projected net economic benefit of $18 to $63 million per year. They further estimate the project would generate 1,420 jobs and generate $143 million in income during construction. The increased holding capacity of the proposed dam would be an estimated extra 133,000 acre-feet of water, all of which would be sold to water contractors, mostly south of the Delta. 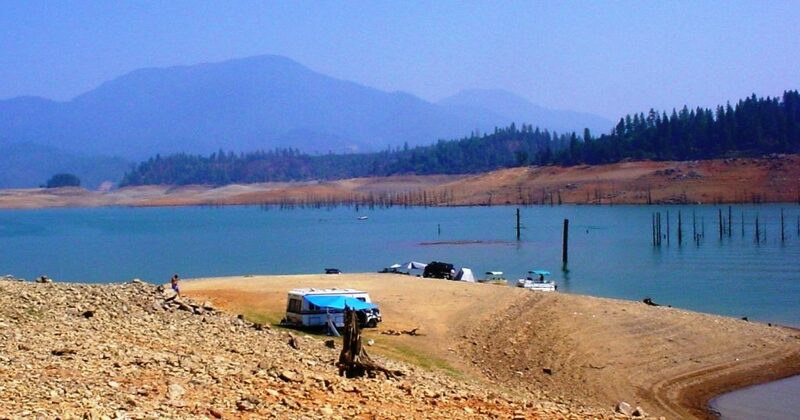 Interestingly, the last time there was a serious government push to raise the level of Shasta Lake was about the same time Brown was pushing the Peripheral Canal. Critics who sense collusion between this project and the Twin Tunnels may be on to something.